Good news: Air travel with a musical instrument should be a lot easier this year in the United States after a final rule issued earlier this week. On Tuesday the U.S. Department of Transportation issued a final administrative rule that fully implements section 403 of the FAA Reauthorization Act of 2012 – the law authorizing musical instruments as carry-on baggage onboard US air carriers. In other words, law now requires that airlines allow passengers to carry musical instruments on board. And this is no longer just a "proposed law" or law waiting to be implemented; it's now official FAA policy regarding musical instrument transportation. The Department of Transportation also created a webpage with tips and information for consumers on how to prepare for air travel with musical instruments. "Airlines are required to allow small musical instruments, such as a violin or guitar, to be carried into the cabin and stowed in approved stowage spaces, if available, and/or under the seat. Once safely stowed, airlines cannot require passengers to remove their instruments, even if space taken by their instrument could accommodate one or more other carry-on items." ...while there might be a more generally informed air crew staff, there's still no guarantee that a violin-carrying passenger will know with certainty in advance that boarding with the instrument will occur. It all depends on available in-cabin stowage space, which of course is never reserved, just taken on a first come, first served basis. Board early if you must fly. 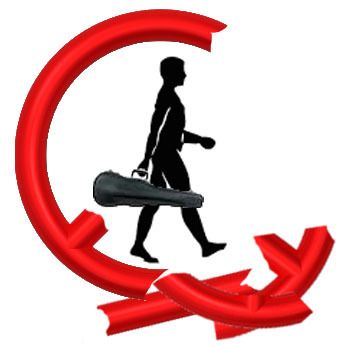 Under the rule, musical instruments as carry-on items are treated no differently from other carry-on items and the stowage space should be made available for all carry-on items on a “first come, first served” basis. Carriers are not required to give musical instruments priority over other carry-on baggage, therefore passengers traveling with musical instruments may want to buy the pre-boarding option offered by many carriers to ensure that space will be available for them to safely stow their instruments in the cabin. This means that if you are among the last to board the airplane and all in-cabin luggage space has already been taken by other passengers, your instrument is out-of-luck and you must fly with the checked luggage. Be aware and take care! It's a step...no guarantees...and (cynical me) I'll believe it works when I hear/see how people and their instruments are now treated. I don't blame anyone for being skeptical! Is there a nice sheet of paper that I can carry along with the insurance policy saying that instrument is not insured for aircraft holds? Does a viola qualify as a "small musical instrument"? I would think so since guitars are included. You can carry this document and highlight section 713. Or get the Time for Three shirt described above!